Sa panahon natin ngayon nagkalat na ang mga Call Center. Kung bubuklat ka ng dyaryo usually makikita mo “HIRING inbo und and outbound TSR and CSR”. Parang mga kabuteng nagsulputan na parang unlimited ang pangangailangan sa man power kasi tuloy tuloy ang hiring. Syempre kailangang makiuso kaya nga ako mag 7 years na ata sa call center industry naging Agent at QA Analyst na ako at kung ano ano pang extra curricular kyembelar sa call centers pero… ang tanong… PAANO MO MALALAMAN NA SA CALL CENTER NAGTATRABAHO ANG KAHARAP MO? 1. Patong patong ang eyebags kasi kulang sa tulog, hirap kasing makatulog sa umaga lalo na kung ang mga kapit-bahay mo ang iingay at nagvivideoke grrrr. 2. 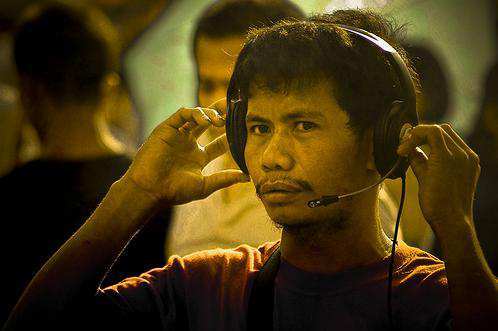 Pag nakasalubong mo sa umaga… ikaw fresh na fresh pa… ang call center agent na pauwi haggard na. 3. Nakajacket kahit tirik na tirik ang araw with matching shades pa.
6. Nag-iinuman ng tanghaling tapat. 7. Laging may dalang mug na lagayan ng kape or jub na lalagyan ng tubig. 8. Laging masakit ang lalamunan at laging paos. Working in a call center really has it perks like high salary, air conditioned office, comfortable working environment, free (but limited) internet access, 2 days off, night shift (night differential pay), monthly bonus, and a lot more. But these benefits wouldn’t be worth it if your not enjoying working with your co-workers and i quote my team lead’s expressions “We joined for things..but we stay for people!”, and this is very true. What i like best in working with these people is that no matter how stressful your job is they always find a way to lighten up your day. Even in a very difficult day and when i say difficult i am pertaining to grandma or grandpa calls, 1000 calls waiting (exaggerated! ), irate callers, tools crashing down… well you get the picture, those were the days that you will feel upset, down, and unmotivated, one of the best way to shake down this feelings is to get a good laugh with your co-workers. We go out or gather around share and ridicule stories of our bloopers during a call. I have compiled some of the funniest call center bloopers I’ve ever heard hope you like it too. TSR: Thank you for calling Dish Network my name is John, may i have your name starting with the area code please! CX: I would like to know how much would it cost me to add HBO? CX: Please add Star Movies and Fox, how much is it? AGENT2: Bonapart!!! Ginamit mo rin yung word. Estimated number??? di ba iyon yun? AGENT1: Shunga!!! Ballpark figure yun! Napoleon Bonapart! May giyera? Agent1: to verify sir, your e-mail address is R for Romeo, A for apple , Y for…for Wyoming…..
Agent2: let me verify your email that’s A as in apple, P as in peter, Q for… Q for Cucumber…. Agent3: so that’s P as in Peter, E as in Eter, T as in Ter, E as in ER, R as in RRrrrrrr!!! Agent: Thank you for calling, this is Bambi speaking, how may I help you? Customer: Who is this again? Agent: Bambi sir, you know the lost deer. Agent: Thank you for calling, this is Dyna speaking, how may I assist you? Agent: (annoyed voice) Its DYNA SIR!!! Agent: Thank you for calling, my name is Lexie, how may I help you? Customer: Do you speak Spanish? Agent: Lo siento, pero yo no hablo español, let me transfer you to our Spanish speaking agent. Customer: You don’t speak Spanish? Interviewer: What is the last movie that you saw? Interviewer: Ok can you tell me what the story is all about? Applicant: Ah… its about a job…in Italy… … … may I go out?